Primary Articles Learning Environment (PALE) NSDL Classic Articles in Context, Issue 1. April 2008.
by Dr. James R. Fleming. 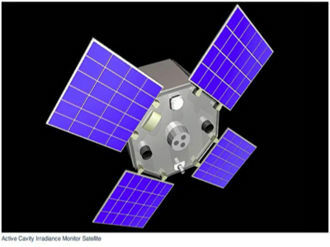 The Active Cavity Radiometer Irradiance Monitor Satellite (AcrimSat) is designed to monitor the total amount of the Sun's energy reaching Earth. Image from NASA Jet Propulsion Laboratory. Anyone seeking to understand climate change and anthropogenic greenhouse warming is well advised to read not only the current literature, but also the key scientific papers of earlier eras. History is particularly relevant since, over timescales of decades and centuries, ideas about the climate have been changing faster than the physical climate system. Thus, students of climate dynamics should also be well read in science dynamics—the change of scientific ideas and practices over time. Historians seek to explain how scientists have established privileged positions on phenomena that cover the entire globe, that have both natural and anthropogenic (originating from human action) components, and that are constantly changing on a multiplicity of temporal and spatial scales. We seek insights into what scientists knew about climate change in any given era and how they came to know it. Properly applied, the long history of science regarding climate change and anthropogenic greenhouse warming is providing insights and perspectives on cutting-edge issues in science and pressing issues in public policy. Original, peer-reviewed publications of scientists, along with archival materials, constitute the basic building blocks of history. Reading a scientific paper “in the author’s words” is a challenging undertaking. It exposes the reader to terminology, technologies, standards, and practices of another era. It might raise more questions than it answers—and this can be a starting point for historical research, or at least it can sensitize the reader to the complexities of the past and place current research in a long line of previous accomplishments. The selection of research articles on climate change and anthropogenic greenhouse warming presented here appeared in peer-reviewed journals over the course two centuries, from 1824 to 1995. Each article is significant in its own right. Some are landmark papers. Each is accompanied by a short essay that provides historical context and points the reader to additional readings and citations. Theory, experiments, measurements, and models are all prominently featured here. The ninetieth century is represented by four papers. Theoretical articles by the French scientists Fourier and Poulliet, dating from the first half of the nineteenth century, and appearing in English translation, introduce a foreign mental world in which the greenhouse effect, the “temperature of space,” and residual heat from the Earth’s formation all play roles in determining terrestrial temperatures. Yet even these theories, which pre-date the basic laws of radiative transfer, were based on careful laboratory experiments and observations of the natural world. 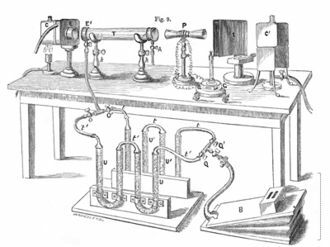 Tyndall’s pathbreaking 1861 paper reports the results of basic laboratory experiments on the absorption properties of what have come to be known as the “greenhouse gasses,” while Arrhenius’s 1896 model, the first of its kind, examines glacial and interglacial conditions as influenced by carbon dioxide concentrations. Here we find the experiment of doubling CO2 in the model and the notion that warming can be magnified at high latitudes. Ekholm’s 1901 review of climate variations is notable for its encyclopedic content and for its examination of human influences on the climate system, including the then new idea of possible anthropogenic greenhouse warming. After a hiatus of several decades, Callendar revived the carbon dioxide theory of climate change in 1938 by linking rising temperatures, rising CO2 emissions, and a new, more detailed understanding of the spectrum of infrared absorption and emission—the so-called “Callendar Effect.” Gilbert Plass strongly supported this conclusion and, in the early 1950s, contributed the first computer models of the natural and human enhanced greenhouse effect. Bolin and Ericksson’s 1958 paper helped clarify the carbonate chemistry of the oceans and their role uptake of carbon dioxide. The prophetic article by Edward Lorenz, published in 1963, had a significant and widespread impact on all of science, and even on popular culture. It serves as a reminder to all climate modelers to account for the chaotic properties of the phenomena they are modeling. The second half of the collection deals mainly with the varieties of climate modeling in the past forty years, since the climate sensitivity studies of Manabe and Wetherald using general circulation models and the energy budget models of Budyko and Sellers. The articles by Hansen et al., Cess et al., and Santer et al. are three examples of such sensitivity studies that bring us up to the recent reports of the Intergovernmental Panel on Climate Change. But there is more to contemporary climate studies than modeling. Keeling’s 1970 article reports on ongoing measurements of CO2 from Hawaii and Antarctica while sounding an environmental warning that is still relevant today. Vonder Haar and Suomi used newly available satellite technology to make direct measurements of the Earth’s radiation budget, a task that has continued ever since. In 1974 chlorofluorocarbons were discovered to be having an adverse chemical effect on stratospheric ozone levels. Within a year Ramanathan pointed to their adverse climatic effect based on their infrared absorption properties. In an exercise sponsored in 1979 by the National Academy of Sciences and often repeated since, Charney et al. synthesized scientific opinion on the adverse effect of rising levels of carbon dioxide. Kellogg’s history of human impact on climate serves to remind us that we have known, for quite a long time, the likely consequences of our unprecedented consumption of fossil fuels. The following articles constitute a pathway through the complexities of the past two hundred years of climate science. Others might have been chosen, and some deserving papers have been omitted in the interest of space, but most will agree, these are all significant contributions to knowledge. Each is accompanied by a short historical essay. In addition to their great diversity of style and the long time span covered, these papers are remarkable for the growing consensus represented here, a convergence of scientific opinion that indicates the seriousness of climate change and our responsibility to take positive steps to reduce human impacts. Fleming, James Rodger, 1998. Historical Perspectives on Climate Change. New York, Oxford University Press. Fleming, James Rodger, 2007. The Callendar Effect. The life and work of Guy Stewart Callendar (1898-1964), the scientist who established the carbon dioxide theory of climate change. Boston, American Meteorological Society. Bourg/Genève, Georg Editeur – Editions Médecine & Hygiène. Handel, M. D. and J. S. Risbey, 1992. An Annotated Bibliography on the Greenhouse Effect and Climate Change. Climatic Change 21, no. 2, 97–255. 1 Fourier, Jean-Baptiste Joseph, 1824. Remarques générales sur les températures du globe terrestre et des espaces planétaires. Ann. chim. phys. (Paris) 2nd ser., 27, 136-67. English transl. 1837 by Ebeneser Burgess, General remarks on the temperature of the earth and outer space. Amer. J. Sci. 32, 1-20. 2 Pouillet, Claude S. M., 1838. Mémoire su la chaleur solaire, sur les pouvoirs rayonnants et absorbants de l'air atmosphérique, et sur les températures de l'espace, Comptes Rendus de l'Académie des Sciences 7, no. 2, 24-65. English transl. 1846 by Richard Taylor, "Memoir on solar heat, the radiative effects of the atmosphere, and the temperature of space." Scientific Memoirs 4, 44-90. 3 Tyndall, John, 1861. On the Absorption and Radiation of Heat by Gases and Vapours, and on the Physical Connection of Radiation, Absorption, and Conduction. Phil. Mag. ser. 4, vol. 22, 169–94, 273–85. 4 Arrhenius, Svante, 1896. On the Influence of Carbonic Acid in the Air upon the Temperature of the Ground. Phil. Mag. ser. 5, vol. 41, 237-276. 5 Ekholm, Nils, 1901. On the Variations of the Climate of the Geological and Historical Past and Their Causes. Quart. J. Roy. Meteorol. Soc. 27, 1-61. 6 Callendar, G.S., 1938. The Artificial Production of Carbon Dioxide and Its Influence on Temperature. Quart. J. Roy. Meteor. Soc., 64, 223–240. 7 Plass, Gilbert N., 1956. The Carbon Dioxide Theory of Climatic Change. Tellus 8, 140–154. 8 Bolin, Bert and Erik Eriksson, 1958. Changes in the Carbon Dioxide Content of the Atmosphere and Sea due to Fossil Fuel Combustion. In The Amosphere and the Sea in Motion: Scientific Contributions to the Rossby Memorial Volume, Bert Bolin, ed. New York, Rockefeller Institute Press, 130–142. 9 Lorenz, E.N., 1963. Deterministic nonperiodic flow. J. Atmos. Sci. 20, 130–141. 10 Manabe, Syukuro and Richard T. Wetherald, 1967. Thermal Equilibrium of the Atmosphere with a Given Distribution of Relative Humidity. J. Atmos. Sci. 24 (May 1967): 241-259. 11 Budyko, M. I., 1969: The effect of solar radiation variations on the climate of the Earth. Tellus 21, 611-619. and Sellers, W. D., 1969. A global climatic model based on the energy balance of the Earth-atmosphere system. J. Appl. Meteorol. 8, 392-400. 12 Keeling, C. D. 1970 “Is Carbon Dioxide from Fossil Fuel Changing Man’s Environment?” Proc. Amer. Phil. Soc. 114, 10-17. 13 Vonder Haar, Thomas H., and Verner E. Suomi, 1971: Measurements of the Earth’s radiation budget from satellites during a five-year period. Part 1: Extended time and space means. J. Atmos. Sci., 28, 305-314. 14 Ramanathan, V. 1975. Greenhouse effect due to chlorofluorocarbons: climatic implications. Science, 190, 50-52. 15 Charney, Jule G., Akio Arakawa, D. James Baker, Bert Bolin, Robert E. Dickinson, Richard M. Goody, Cecil E. Leith, Henry M. Stommel, and Carl I. Wunch, 1979. Carbon Dioxide and Climate: A Scientific Assessment, Washington, DC, National Academy of Sciences, 22 pp. 16 Hansen, J., D. Johnson, A. Lacis, S. Lebedeff, P. Lee, D. Rind, and G. Russell 1981. Climate impact of increasing atmospheric carbon dioxide. Science 213, 957-966. 17 Kellogg, W.W. 1987. Mankind’s Impact on Climate: The Evolution of an Awareness. Climatic Change 10, no. 2, 113-136. 18 Hansen, J., I. Fung, A. Lacis, D. Rind, S. Lebedeff, R. Ruedy, G. Russell, and P. Stone 1988. Global climate changes as forecast by Goddard Institute for Space Studies three-dimensional model. J. Geophys. Res. 93, 9341-9364. 19 Cess, R. D., G. L. Potter, J. P. Blanchet, G. J. Boer, S. J. Ghan, J. T. Kiehl, H. Le Treut, Z.-X. Liang, J. F. B. Mitchell, J.-J. Morcrette, D. A. Randall, M. R. Riches, E. Reockner, U. Schlese, A. Slingo, K. E. Taylor. W. M. Washington, R. T. Wetherald and I. Yagai, 1989: Interpretation of cloud-climate feedback as produced by 14 atmospheric general circulation models. Science, 245, 513-516. 20 Santer, B. D., K. E. Taylor, T. M. L. Wigley, J. E. Penner, P. D. Jones and U. Cubasch, 1995: Towards the detection and attribution of an anthropogenic effect on climate. Climate Dynamics 12, 77-100.
a. What role does scientific history play in the study of ongoing scientific issues such as climate change and anthropogenic global warming? b. How would you compare and contrast the early articles in this collection with those from the more recent past? What does this suggest about the changes in science over this time period? c. What role can history play in the formulation of sound public policy, both for science and about scientific issues such as climate change and anthropogenic global warming? The advice of Thomas Ackerman, Erik Conway, Gregory Cushman, Jeffrey Gaffney, Jacques Grinevald, Robert Henson, Vladimir Jankovic, Michael MacCracken, Naomi Oreskes, and Connie Uliasz is deeply appreciated, as is the assistance of Colby College student Daniel Opalacz and the students in ST398, Climate Change History and Public Policy. James Rodger Fleming is a historian of science and technology and Professor of Science, Technology and Society at Colby College, Maine. His teaching bridges the sciences and the humanities, and his research interests involve the history of the geophysical sciences, especially meteorology and climate change. Professor Fleming earned a B.S. in astronomy from Pennsylvania State University, an M.S. in atmospheric science from Colorado State University, and an M.A. and Ph.D. in history of science from Princeton University. In 2003 Professor Fleming was elected a Fellow of the AAAS "for pioneering studies on the history of meteorology and climate change and for the advancement of historical work within meteorological societies." He also was awarded the Ritter Memorial Fellowship at Scripps Institution of Oceanography. In 2005-06 he held the Charles A. Lindberg Chair in Aerospace History at the Smithsonian's National Air and Space Museum. In 2006-07 he was awarded the Roger Revelle Fellowship in Global Environmental Stewardship from the American Association for the Advancement of Science (AAAS) and served as a Public Policy Scholar at the Woodrow Wilson International Center for Scholars. 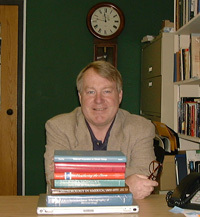 Professor Fleming is the founder of the International Commission on History of Meteorology and the editor of its journal, History of Meteorology. His books include Meteorology in America, 1800-1870 (Johns Hopkins, 1990), Historical Perspectives on Climate Change (Oxford, 1998), The Callendar Effect (American Meteorological Society, 2007), and Intimate Universality: Local and Global Themes in the History of Weather and Climate (Science History Publications/USA, 2006). He is currently writing a history of weather and climate control and is convening several national and international conferences. Please direct any questions, comments, or suggestions to Michael Luby, Executive Editor, NSDL Classic Articles in Context. This page was last modified on 12 August 2011, at 10:36. Content is available under Creative Commons Attribution-Noncommercial-Share Alike 3.0 Unported License.